Southern Pines, NC (PRWEB) November 27, 2007 — Executive Coach, Bea Fields, joined a distinguished panel of Generation Y business leaders at the International Coach Federation (ICF) Annual Conference in Long Beach, CA, to present on the topic of Coaching at the Speed of Y: Bringing Coaching to the Next Great Generation of Leaders. Along with Scott Wilder, Jim Bunch and Rob Newbold, Fields is the co-author of Millennial Leaders: Success Stories From Today’s Most Brilliant Generation Y Leaders. (http://MillennialLeaders.com). Fields shared the stage with co-author, Scott Wilder, General Manager of Intuit’s Online Community, David Charles Cohen, Chief Executive Maestro of Writers of the Round Table Inc., Misti Burmeister, CEO of Inspirion, Inc. and 19-year old Ben Casnocha, Founder of Comcate. Fields’ mission with this presentation was to provide professional coaches with strategies on how to achieve greater levels of success by learning how to attract Generation Y while inspiring older generations to gain a greater understanding of Gen Y’s world views. Millennial Leaders brings readers a unique, close up look at the people responsible for the cutting edge of social and business trends. 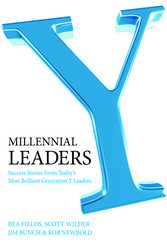 The authors offer interviews with Wilder, Cohen, Burmeister and Casnocha as well as 21 other key Generation Y experts. For more details about Millennial Leaders: Success Stories from Today’s Most Brilliant Generation Y Leaders, visit http://MillennialLeaders.com or contact Bea Fields at (910) 692-6118..